This is the first game in the Grand Theft Auto series. For other games in the series see the Grand Theft Auto category. Grand Theft Auto (GTA) is a game created by DMA Design (now Rockstar North) and published by ASC Games in 1997/1998. The game allows the player to take on the role of a criminal who can roam freely around a city. Various missions are set for completion, such as bank robberies, assassinations, and other crimes. 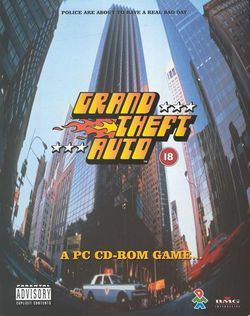 It is the first in the Grand Theft Auto series that has thus far spanned nine standalone games, and two expansion packs. Grand Theft Auto is now available as a free download from the Rockstar Games website as part of the "Rockstar Classics" line which also includes Grand Theft Auto 2. This page was last edited on 30 May 2016, at 05:24. This page has been accessed 14,885 times.